A new federal program will soon transform the homes of public housing tenants in some mixed-income developments into smoke-free zones. But the owners of the for-sale units at the mixed-income sites can smoke all they want, according to the Chicago Housing Authority. Under the new pilot “Tobacco Prevention Project,” proposed by the City of Chicago and funded by the federal government, public housing residents who want to quit smoking at the CHA’s West Side Roosevelt Square mixed-income community and at three other CHA sites will be able to participate in “cessation classes” and receive counseling to help them kick the habit. ials were joined by Kathleen Sebelius, secretary of the US Department of Health and Human Services. RJ asked Sebelius why the initiative targeted public housing residents, and if this could be viewed as a discriminatory practice. Sebelius said that the pilot program wasn’t entirely focused on public housing residents, but was a Chicago-wide effort with various strategies to reduce tobacco use and exposure to second-hand smoke as well as to help people who want to stop smoking. “This is a proposal that came out of the City of Chicago, that came out of your local residents here and your public health officials, and it really gives some taxpayer dollars back to Chicago for an effort that makes healthier communities throughout this city,” Sebelius said. CHA chief Lewis Jordan told RJ at the press conference that incoming public housing residents would have a choice of whether they would live in designated smoke-free zones, and wouldn’t have to sign any smoke-free pledges as part of their lease agreements. Currently, 500 families live at the Roosevelt Square mixed-income housing site. Jordan added that a public hearing would be held at some point to talk about the pilot program. 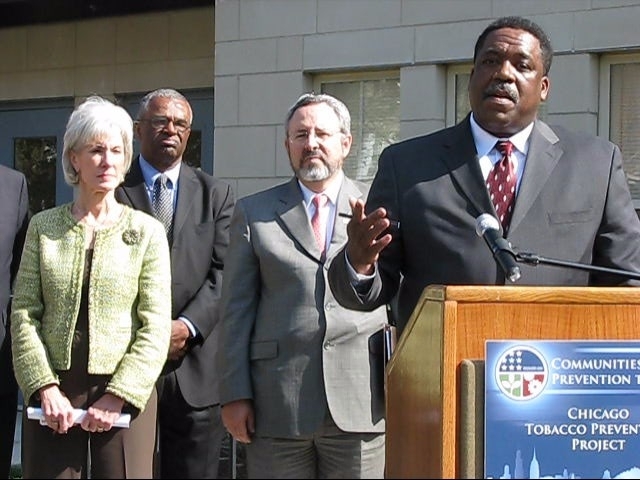 The Chicago Tobacco Prevention Project aims to implement citywide policies to decrease tobacco use and exposure to secondhand smoke, with concentrated efforts aimed at “specific groups at high risk for tobacco use,” according to data from the non-profit Respiratory Health Association of Metropolitan Chicago provided at the April 22 press conference announcing the new initiative. Nationally, 21 percent of people smoke. Twenty four percent of all adults in Chicago smoke, but smoking rates were higher for “vulnerable” population groups such as people with mental health issues, 63 percent of whom smoke. Forty-nine percent of lesbian, gay and bi-sexual youths are smokers, as are 35 percent of lesbian, gay and bi-sexual adults, 45 percent of food service employees, and 30 percent of active military personnel. In the city’s Lawndale neighborhood, the smoking rate is 35 percent, according to Joel Africk, president and CEO of the Respiratory Health Association of Metropolitan Chicago. “The idea here with this grant from Health and Human Services and the CDC is to train people in the community. So that when one in the community wants to quit, they don’t have to get on a bus and start calling somebody they don’t know but they can come to somebody in their community who has been trained in the best strategies to make their quit-effort succeed,” Africk said. In an April 30 e-mail, CHA stated, “Infractions of the no smoking policy will be given reminders of the policy, referred to smoking cessation classes and be provided with information about outdoor smoking areas,” instead of being evicted. Smoking will be prohibited within 15 feet of a building entrance that has the no smoking policy, and will apply to leaseholders of the affordable rental units. Public housing residents and the other market-rate renters who were living in the buildings before they were designated no smoking zones will be exempt from the policy. “Only those who move into a unit after the policy is implemented will be affected,” CHA stated. “Other housing authorities across the country have adopted no-smoking policies, and HUD encourages no smoking policies for public housing. But CHA is only testing these policies. This entry was posted	on Wednesday, June 9th, 2010 at 12:16 am. You can follow any responses to this entry through the RSS 2.0 feed. You can leave a response, or trackback from your own site.